Few thought Chelsea would reach the 2012 Champions League Final. Even fewer thought they would make a serious claim for the title once there. Exactly how improbable was Chelsea’s run to European glory last season? 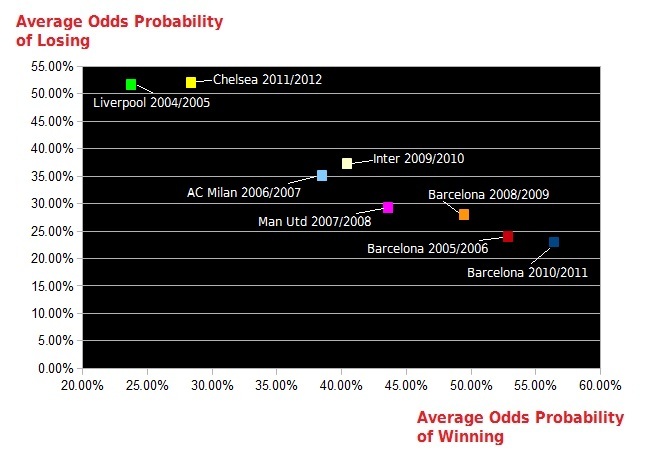 Well let’s take a look at how the bookmaker’s saw Chelsea’s chances as the Champions League 2011/2012 edition evolved. Through the Group Stage, Chelsea found themselves favoured for victory in each match of their six contests, being at odds of less than even money to win on four occasions. Over their six Group Stage matches, Chelsea’s average odds to win were 1.71, an implied probability of just over 58%, while the average odds for a Chelsea loss across those same matches was 4.55, an implied probability of almost 22%. How does this compare with previous Champions League winners? The chart below shows us. Above we see the average odds (implied probability) for the last 8 Champions League winners to both win and lose throughout the Group Stage and 1st knock-out round of the tournament. Of course, this is largely dependent upon which clubs they were drawn against. Even still, we can see that the bookmakers rated Chelsea’s chances of victory and defeat through the Group Stage and 1st knock-out round, similarly to past European title winners, within the same range of both Manchester United’s 2007/2008 team and Barcelona of 2005/2006. We can also see that of the last 8 Champions of Europe, the Liverpool team of 2004/2005 and the Inter club of 2009/2010 were highly doubted by the betting markets through the Group Stages of their championship campaigns with Liverpool average odds of 2.45 to win (just over 41% implied probability), 2.95 to lose (implied probability of 34%) while Inter were average odds of 2.35 to win (just over 42% implied probability) and average odds of 2.95 to lose. So let’s take a look at the betting expectations of the last 8 Champions League winners from the quarter finals onwards. Below we can see that only Liverpool of 2004/2005 were more unexpected to proceed than the Chelsea team of 2011/2012. We can also see that the three Barcelona champion teams of 2005/2006, 2008/2009 and 2010/2011 all very much firmed as the tournament entered the last 3 rounds of their title claiming seasons. 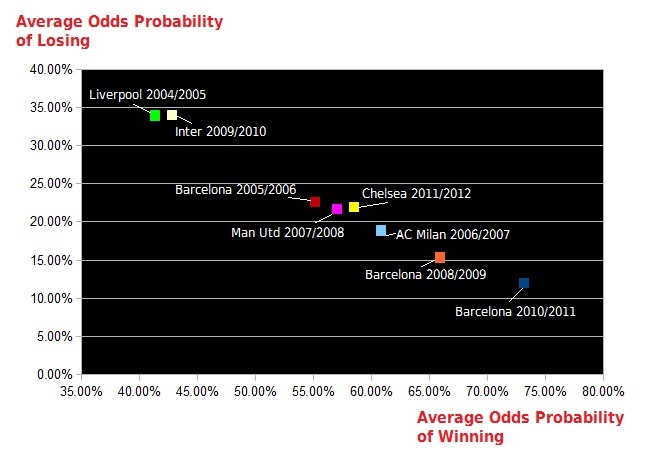 In fact they were the only clubs of the last 8 European title holders to have had average odds of losing through the last 3 rounds of the tournament of 28% or less and were similarly the only clubs to have average odds of winning of 49% or greater, being average odds of less than even money in the last 5 matches of both their 2005/2006 and 2010/2011 title runs. It’s safe to say that Chelsea defied expectations proceeding through the Champions League knock-out stage last season. For punters who defied the bookmakers opinion and backed the London club, it was a very profitable campaign.